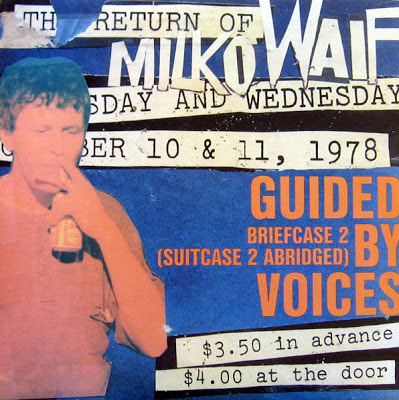 Like the original Suitcase release in 2000, the second installment was released along with a fan friendly, highly collectible LP entitled Briefcase. Unlike the first Briefcase installment, the 2nd contained two unreleased bonus tracks, making it highly collectible. Briefcase 2 contains 18 songs, 16 off Suitcase 2 collection, with the following 2 tracks being exclusive to this blue vinyl. To add to the exclusivity of this release, it was also limited to 1500 copies. Lion W/ Thorn In Paw- 1 For real Guided by Voices enthusiasts, this song positively vital solely for the following line; "IS ANYBODY READY TO ROCK!" Sound familiar? Yes, it is the intro to "Over The Neptune/Mesh Gear Fox" which is the song that kicks off Propeller! Wow, an unearthed live recording that spawned the infamous saying among Pollard worshipers. Unfortunately, the phrase is the sole bright spot of this song. Well, that and Pollard's response of "This song does not rock." He's completely correct, it does not. Rickety steady bass lines join wanking one string guitar plucks that teeter on being (somewhat middle eastern sounding (by accident I'm sure). Other than the spoken intro, the song remains vocal-less. Hi-hats keep time, not much reason to hit repeat on this one. Superwhore- 4 The somewhat famously "lost" track was recorded for GBV's Under The Bushes Under The Stars, but was ultimately scrapped from the LP. This track, recorded with the infamous Steve Albini, had been in the closet for years. Straight-up, chaotic mid-90s GBV material with rumbling, Albini-recorded drums, complete with huge guitar sound. The track remains pretty lo-fi , and in fact it was reported that it had been put through the lo-fi wringer once the original tracks were received by the band. "Superwhore" is a heavy hitter, with soaring pop melodies reminiscent of other GBV lo-fi arena rockers at the time. Worth a spin to say the least. kind of like "lion." And "Superwhore" is awesome. Can kind of understand why it was kicked from UtBUtS, though. Would have made a great B-side or EP track though.